The Issaquah Highlands is a 2,200 acre planned community in King County, built with the intention of creating green, efficient space in which residents can both live and play. The Highlands melds suburban life and urban amenities into one area full of luxury homes, townhouses and condominiums for sale, plus schools, shopping/dining, entertainment, and recreation. Most of the homes in Issaquah Highlands were built from the 1990's to present day new construction. The community is located between Issaquah and Klahanie, just north of I-90 for easy commuting. 3 Beds | 3.5 Baths | 2410 sq. Ft.
4 Beds | 3.75 Baths | 3930 sq. Ft.
4 Beds | 3.5 Baths | 2172 sq. Ft.
4 Beds | 2.5 Baths | 2410 sq. Ft.
3 Beds | 2.75 Baths | 1594 sq. Ft.
3 Beds | 2.75 Baths | 1467 sq. Ft.
3 Beds | 3 Baths | 1467 sq. Ft.
2 Beds | 2.25 Baths | 1673 sq. Ft.
2 Beds | 1.75 Baths | 928 sq. Ft.
3 Beds | 2.5 Baths | 2347 sq. Ft.
Blue Summit Realty has the most accurate and up to date Issaquah Highlands real estate listings on the web. Currently there are 26 homes for sale, 11 condos for sale, in Issaquah Highlands. Of the 37 total Issaquah Highlands residential listings for sale 0 are bank owned, 0 are short sales, 0 are new construction, and 0 are townhomes. The price ranges from $369,641 to $0 with a median list price of $777,358 and median sold price of $821,188. 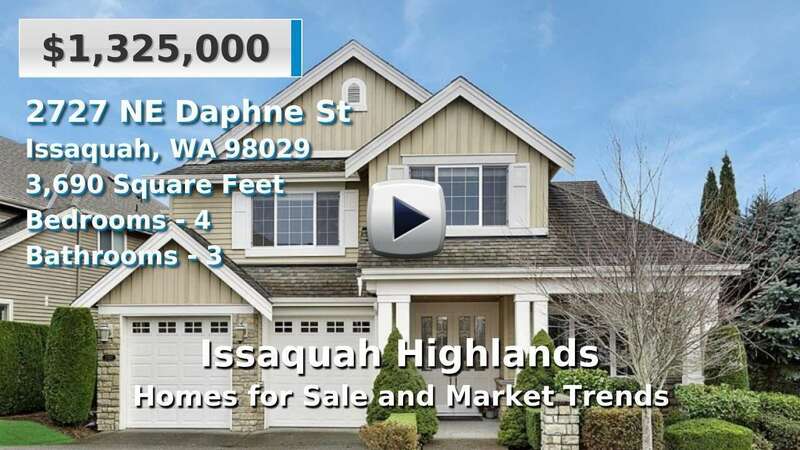 Make sure to refine your Issaquah Highlands real estate search by property type, price, square footage, bedrooms, bathrooms and more with the search tool above or view the Issaquah Highlands listings on our interactive map. Our Issaquah Highlands real estate listings were updated 29 minutes ago.